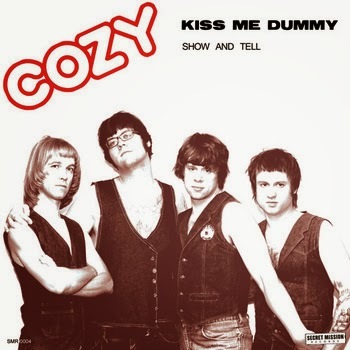 I really like the dudes on the cover of Cozy’s “Kiss Me Dummy” these fisted riffs and over the top Dictators snotty punk vocal you can barely understand cuts through the chunky bubblegum garage rock thats taking place and with that cover this thing should be flying off the shelves. Kiss me dummy? Perfect lyrics. New York Dolls taken to this ridiculous place that comes back around and becomes punk again because it's so insane. Handclaps and KICK DRUM. Ooooo's mirror the sustained chord strikes. Real party rock that’s silly and just fun, like an extreme Jeff Novak, a little glam distorted buttery solo and back onto the handclaps kick stomp that they smartly make go on forever. Who wouldn't like this kind of drunken mess attitude and most of all vests. Guys, I'm impressed. I also like that it's important they all touch each other on the cover, well thought out. B-Side’s “Show and Tell" opens on that lonely kick and a vocal ‘ba ba ba’ melody that he just made up. Big chords in that crunchy '70s overdrive nailing this Saturday night sound, especially the vocals. “I’ll show you mine / you show me yours” definitely talking about getting naked. I always admired those bands that can get away with songs like this, not just get away with but take the most ridiculous thing that should be impossible to take seriously and then they sell it so hard that you have to have a good time. They go into a show knowing they have to win you over. They don't walk in thinking the audience is lucky to have gotten a ticket. They’re glad to play for you and want to make sure you love it...and your little sister is going to hang this sleeve on the wall and agonize over who's cuter. Ordered! I'm looking forward to their HoZac debut LP. God forbid you didn't have EVERY hozac release! It's to a point now where I can't stop. What am I gonna do, NOT buy their records?